Schnoebelen also mentions a little pin many Masons wear on the lapel of their jacket or coat shaped like a hockey stick with two balls attached. It is named "Tubal Cain." In reality, it represents a man's phallus and testicles; yet, the pin is worn publicly and proudly by many perverted Masons. 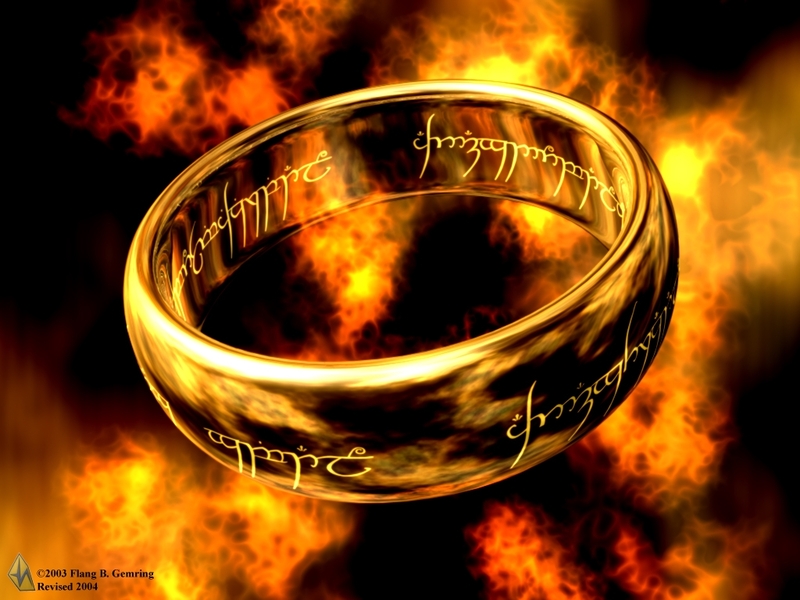 "Rings were traditional symbols of the bond between chieftains and their warriors in Anglo-Saxon England." 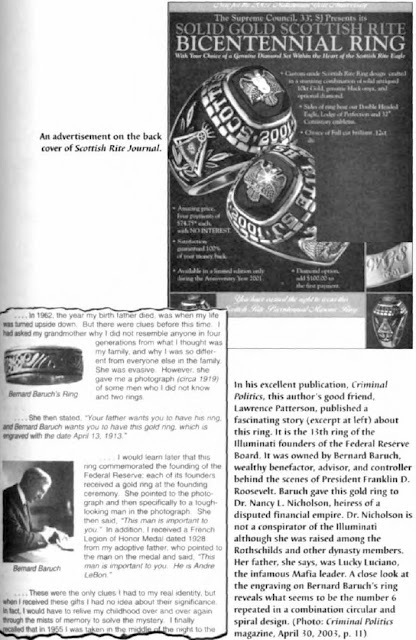 The ring, then is a symbol of authority, of bonding, and is a sign of the covenant made between the inferior and superior members of the Illuminati group. In ancient religions and cultures, rings were also magical in nature. According to cabalistic rabbis, King Solomon used a magic ring with a hexagram symbol on it to enslave the demon Asmodeus into helping him build his famous Temple. In today's Illuminati, the philosophy underlying the use of rings, neckties, etc. continues from such traditions. 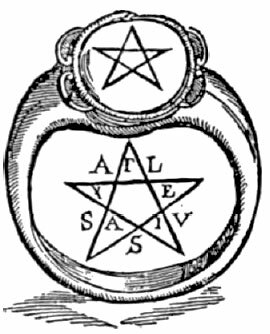 The ring is configured as a circle, implying the supposed eternal reign of their God, Lucifer. He shall, they declare, wear a crown of gold. Thus, the metal of gold is favored. The Masonic fraternity teaches the illusory goal that all who are initiated into its ranks are bonded by the "Mystic Tie" of fellowship. Of course, this is allegory, and yet the necktie does seem to have a special place in Masonic lore and symbology. It is believed that both the bowtie and the traditional necktie are of Masonic symbolic design. The necktie has two triangles descending, a larger and a smaller. 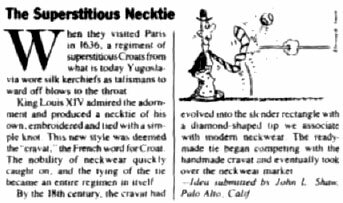 It is tied into a "knot" at the neck, signifying solidarity and unity. The neck itself, as a part of the human anatomy, represents the virtue of sacrifice. In terms of the secret order or secret society, it symbolizes sacrifice of the individual to the common good of the organization. The necktie is also seen as a bridge to two other triangles ~ those of the shirt collar. All of the triangles, on the tie and on the shirt collar, have their point, or spear, downward, toward the realm that is the controlling force of Masonry. Congressman Lloyd Poggett (D-TX), at center, is sworn in as a voter registrar for the State of Texas. The elite of the Democrat Party in Doggett's Austin, Texas district are heavily Freemason. Doggett's necktie has the Masonic "X" symbol, connected to worship of Osiris the Egyptian sun God. 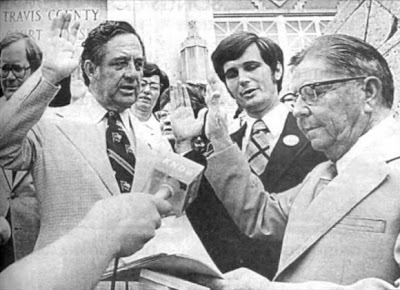 At Doggett's left is the late Congressman Jake Pickle (D-TX), a Mason who for years was Chairman of the House Committee on Banking and Currency. 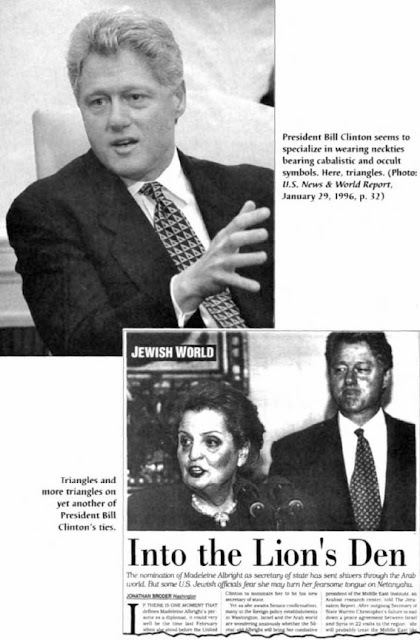 Pickle refused to allow the U.S. Treasury, which he oversaw, to remove the Illuminati's pyramid and all-seeing eye symbols from the U.S. dollar bill. 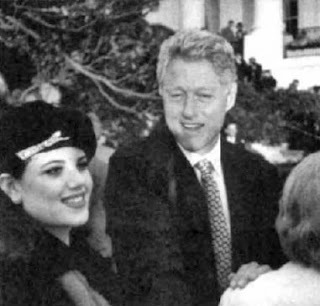 According to news reports, Monica Lewinsky, President Bill Clinton's White House intern lover, gave him a special necktie. When he wore it, she could watch him on TV and know he was thinking about her. Bill Clinton's mother, Virginia, with his father, before he was born. Virginia, a Jewess, was deep into the supernatural magic of the Cabala. Bill Clinton's father is a dead ringer for Jack Ruby, the Jewish gangster and homosexual who assassinated Lee Harvey Oswald. 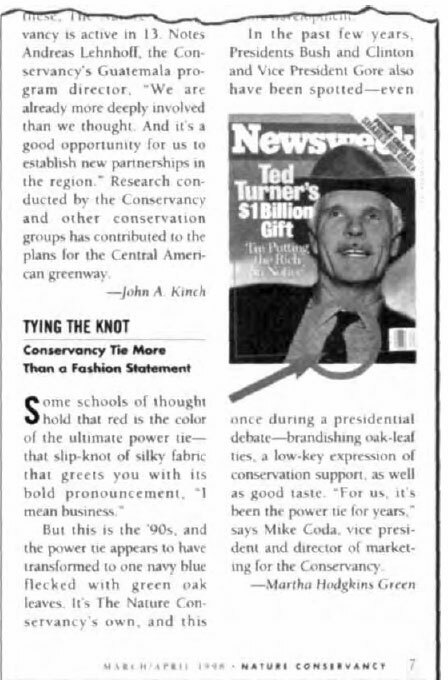 The Nature Conservancy, a radical environmental group, boasted in its March/April 1998 magazine that CNN founder Ted Turner, Presidents Bush and Clinton, and Vice President Gore often wore oak-leaf ties to denote their support for environmental causes. The oak tree and its leaves are a staple of druid witchcraft and are popular as symbols among nature followers of the forest horned God Pan. 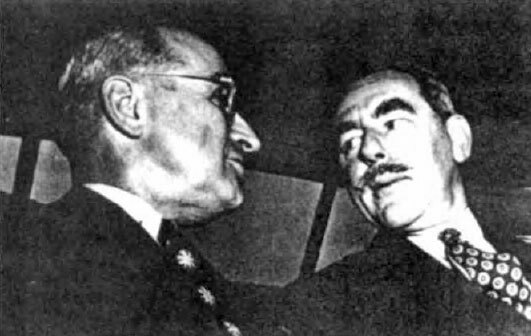 President Harry Truman (left) and Secretary of State Dean Acheson, both Illuminati initiates, each wear neckties imprinted with "sun God" symbols. 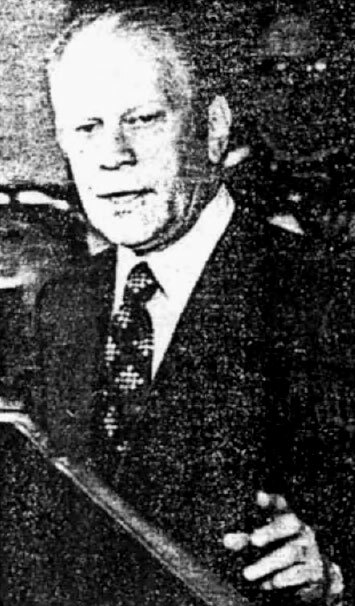 President Gerald Ford, a 33rd degree Mason, wears a necktie with the "cross of Baphomet" emblem of the occultic OTO and British satanist Aleister Crowley. The symbol is also worn by the Sovereign Grand Commander of Scottish Rite Freemasonry. Ford was a member of the Warren Commission that came up with the preposterous conclusion that Lee Harvey Oswald acted alone in the assassination of President John F. Kennedy. Chief Justice Earl Warren, like Ford and all the other members of the commission, was a 33rd degree Mason. House Speaker Newt Gingrich wears a necktie designed by Satan worshiping rock music star, Jim Morrison of The Doors. 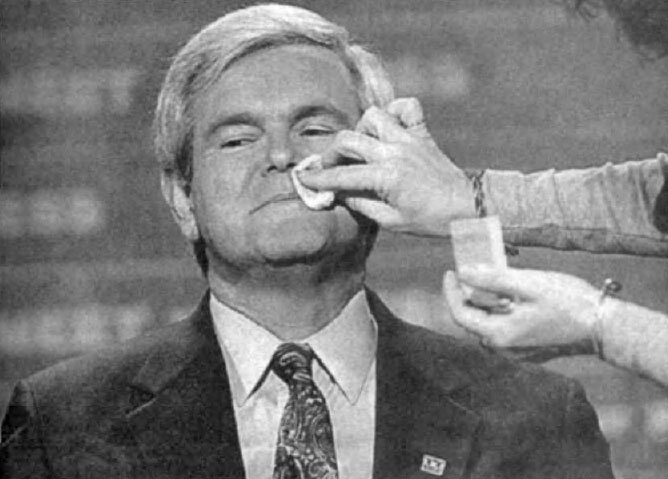 Illuminist signals: Insiders say speaker Newt Gingrich is a vain man who does not like being photographed without make-up. 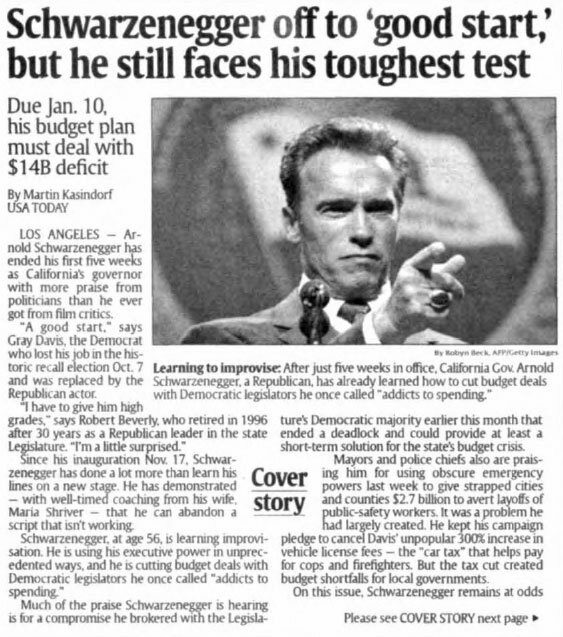 Here he is below pictured in USA Today newspaper (December 5, 1994, p. SA) primping for a taping of NBC's "Meet the Press." This provides greater curiosity about Time's running as its front cover (see following page of Codex Magica) a staged picture of Gingrich in which the speaker is looking haggard and sweaty, his face red-flushed, and needing a shave! 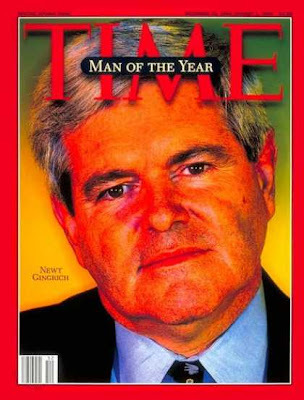 At left: This cover of Time announcing the selection of House Speaker Newt Gingrich as Time's "Man of the Year" reveals many mysteries. First, the issue is dated December 25, 1995/January 1, 1996. December 25th, Christmas Day, is also the day the ancient Romans and Greeks worshipped the Sun God. In his photo, Newt Gingrich appears tired and dismayed. He is sweaty. No make-up is used, and he has a day old growth of stubble on his face and neck. There is also a red coloration or flush on Newt’s face. His head is strategically placed behind the Time logo, communicating the subtle message that his time in the political limelight is about up. In fact, Gingrich did abruptly resign and leave his high level post shortly after this issue; some believe his departure was caused by his unseemly romantic liaison with a female staffer, an affair which prompted the Congressman to divorce his wife. However, the most significant images you'll find on this cover are hidden on Newt Gingrich's necktie! Look closely at the inset and what do you see? A dinosaur. The cave age monster is facing downward toward a flower. The Illuminati's founder Adam Weishaupt, in the late 18th century, introduced the concepts of "flower power" and nature worship (shades of the hippy era of the 60s!). So that might explain the flower. But what about the dinosaur? It seems that Newt (get the name, Newt ? ~ isn't a Newt a form of lizard?) is a dinosaur fan. Gingrich once borrowed a Tyrannosaurus Rex dinosaur bones exhibit from Washington, D.C.'s Smithsonian Museum and kept it on display for a long time in his House Speaker's office. 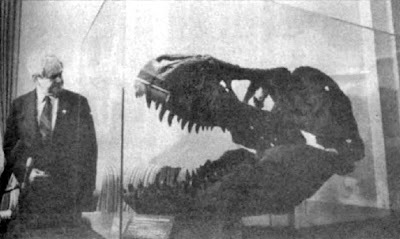 Newsmagazines often commented that Newt Gingrich was wry proud of the T-Rex display and constantly asked friends and associates, "Would you like to see my T4tx!" Now, Webster's dictionary informs us that the root word for "tyrannosaurus" is rvranr, or tyranny, defined as "A government in which absolute power is vested in a single ruler" ~ a ruler unfettered by a constitution! What's more, the short version of the dinosaur's name, T-Rex, would have a very special meaning for occult illuminati. 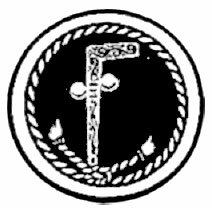 "T" stands for Tammuz, the Christ figure to come, whose symbol is the T, or Tau cross. The word "Rex," meanwhile, stands for Man as King. In Weishaupt's Illuminati system, the highest degree initiate earned the "Rex" degree. Thus, the symbols on Newt Gingrich's necktie, displayed for all the world to see, but for only Newt and his Illuminati henchmen to understand, trumpet this message, that: Our llluminati goal is a tyranny, ruled by a single ruler ~ the fearful antichrist, beast of prophecy! The caption reads: "Speaker Newt Gingrich shows off tyrannosaurus rex Osborn in his Capitol office. It's on loan from the Smithsonian." 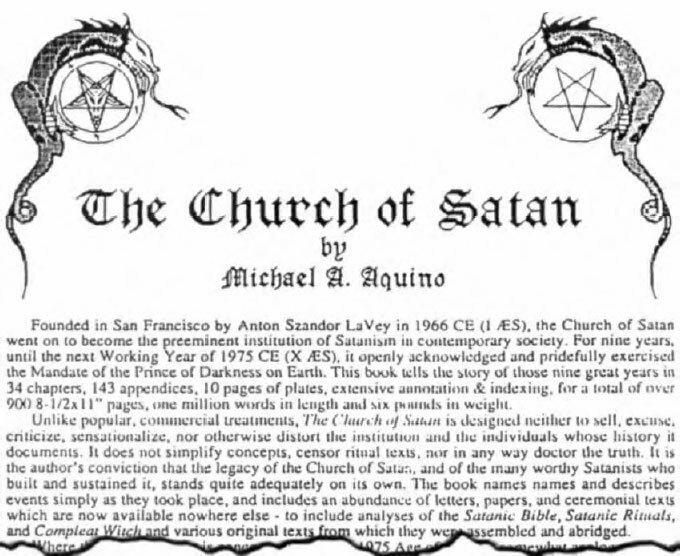 When I sent Dr. Cathy Burns, a foremost authority on occult symbols and their meaning, a copy of speaker Newt Gingrich's Time magazine photo with the T-Rex dinosaur image on Newt's necktie, she sent me back this flyer advertising a book, The Church of Satan, written by Luciferian High Priest Michael A. Aquino. 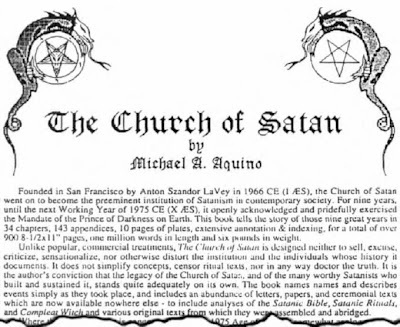 As you can see, the flyer has images of two dragon serpents atop satanic pentagrams facing each other (the occult sign of duality, or "as above, so below"). In fact, the two serpentine dragons do resemble the T-Rex dinosaur image. 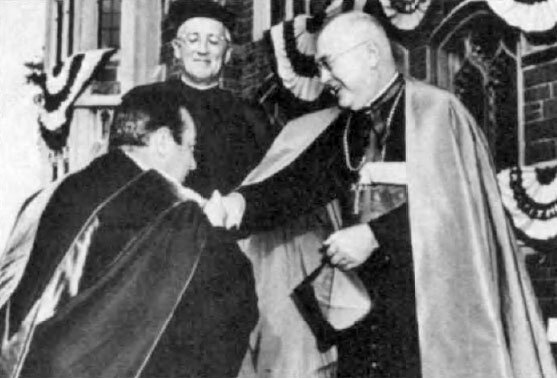 New York Mayor Wagner kneels and kisses the ring of Catholic Cardinal Spellman as Reverend McGinly, president of the Jesuit-run Fordham University, looks on with a sly grin on his face. It seems that California Governor Arnold Schwarzenegger ("The Terminator") is well-schooled in the propaganda value of well-placed props in photographs, such as the U.S. flag, the State seal, and even a broom! 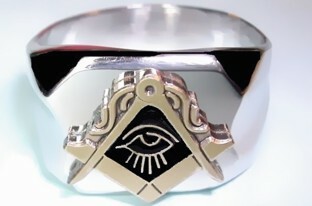 What is most fascinating, however, is the big, blue sapphire Masonic ring the Governor wears and so readily shows off. Apparently, the media know what's what and the photographer always seems to be glad to picture Arnold's ring up close. 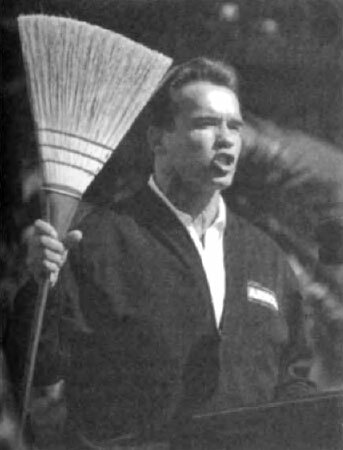 Oh, about the broom: That's not the same one that Arnold's wife, Kennedy heiress Maria Shriver, flies around on, is it? 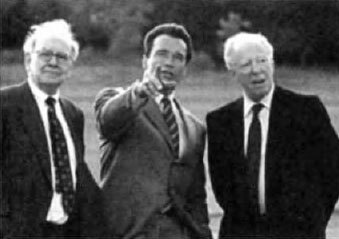 Recently, Bohemian Grove alumnus Arnold Schwarzenegger met privately with Warren Buffett (left), America's second richest man according to Forbes magazine, and Britain's Lord Jacob Rothschild (right), at the Rothschild mansion in England. 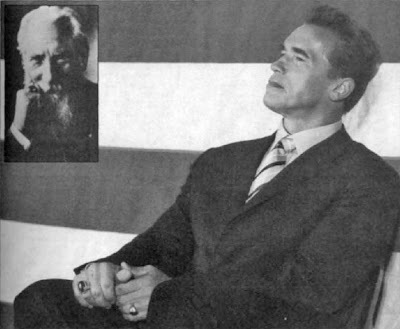 Schwarzenegger evidently earned the endorsement and support of Jewish groups the old-fashioned way ~ he "bribed" them with millions of dollars! Arnold Schwarzenegger, Mr. Universe, giving a very familiar hand salute. 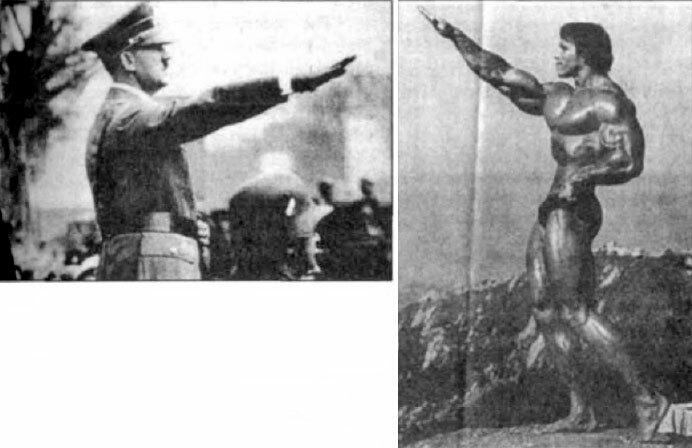 Schwarzenegger once remarked: 'I admired Hitler because he came from being a little man with no formal education up to power." Sort of a feminine version of the ring worn by Governor Arnold Schwarzenegger. Offered in The Pyramid Collection catalog, 2004. Also available in The Pyramid Collection catalog, this "Midnight" cape. The catalog says it is "fit for a Count ~ or Countess." The color of the cape is listed as black and red. "It makes a fiery statement," says the advertising copy. 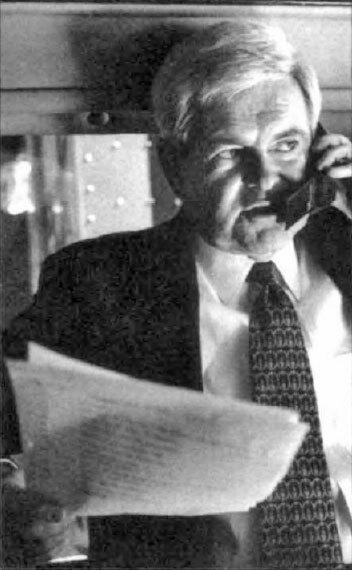 This issue of Media Bypass magazine (September, 1996) featured the activities of Charles Hayes, who was said to be a retired operative of the CIA. According to the magazine, Hayes had been busy in retirement as a vigilante exposing the financial skullduggery and crookedness of various high-level politicians and world leaders. 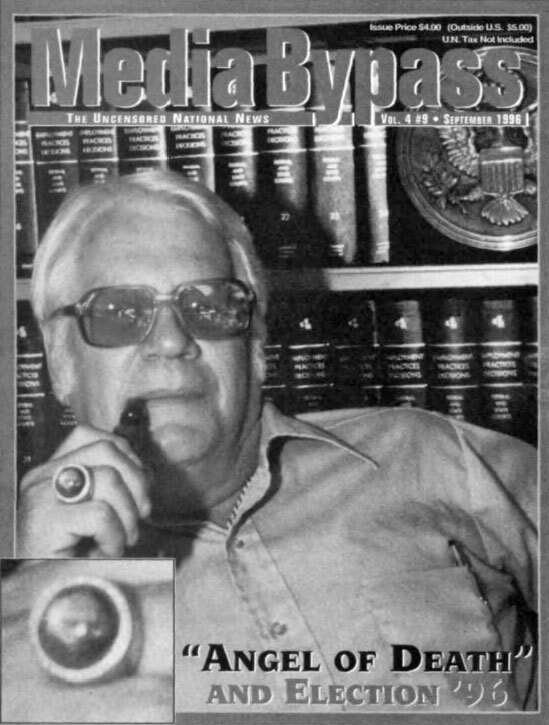 On the cover of the magazine we find Mr. Hayes in front of law librarypublications and a Great Seal of the U.S. plaque, puffing placidly on a pipe. 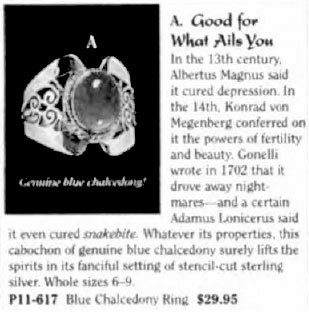 But what stands out is the mysterious ring with the devilish face, composed of some type of blackish material, inside a circle. A few months after this issue was published, Charles Hayes was indicted by a federal grand jury and arrested. News reports allege that Hayes was guilty of solicitation of murder. Did the revelations contained in the article in Media Bypass cause the elite to take action to shut him up? Or was something else up? What is the riddle of the mysterious ring with its curious image? This mysterious photo of Oscar-winning actress Julia Roberts in Time magazine gives us an intriguing view of two rings she wears. On her right hand is the blue-stoned rectangular ring, and on her left hand is a ring with a strange image, indeed one could even say the ring has a creepy and eerie image. 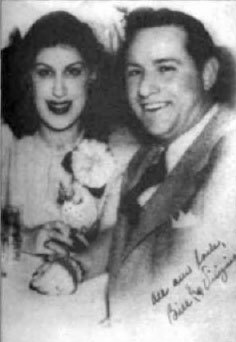 In the accompanying article, the writer acclaims Roberts as "the reigning queen of Hollywood." Without caption, Brill's Content magazine published this photo of Russian President Vladimir Putin. The black border is unusual and obviously connotes a dark and evil significance to Putin's character. 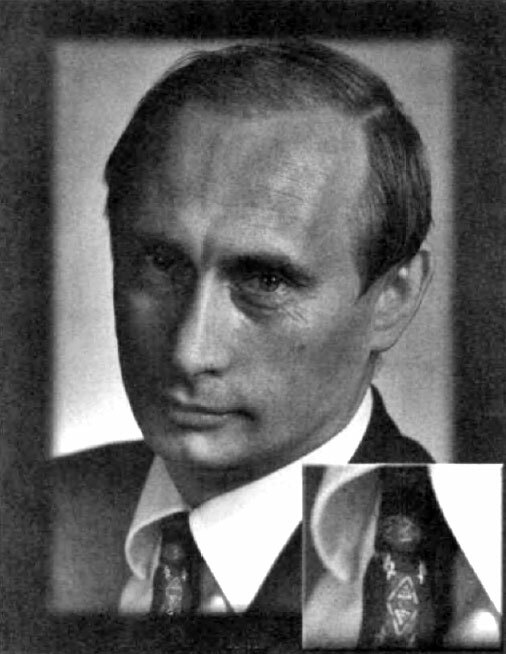 The necktie Putin wears has Illuminist meaning. The X of Osiris is prominent in the design as is the two triangles ~ one pointing up, the other down ~ inside a diamond. Manly P. Hall, 33o, informs us of the occult meaning of the Pythagorean Signet Ring in his classic textbook, The Secret Teachings of All Ages. 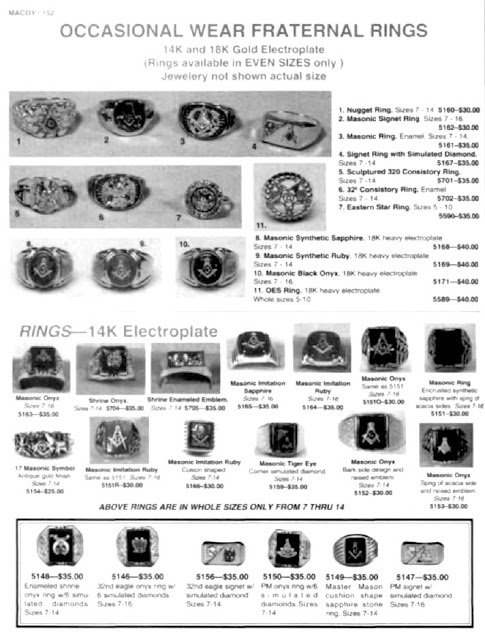 Albert Pike, former Sovereign Grand Commander of the Scottish Rite Masons, wrote in Morals and Dogma that the pentagram (pentacle, cabalistic star) on this ring "carries with it the power of commanding the spirits." Use it, he instructed, to "bind the demons of the air, the spirits of fire, the spectres of water, and the ghosts of the earth." Note that the star atop the ring is encircled by the Oroboros serpent.